Should You Use Scotiabank's Bank The Rest Savings Program? Should You Use Scotiabank’s Bank The Rest Savings Program? When you think about spending money, you don’t often think of saving at the same time. However, Scotiabank is allowing you to do just that… save at the same time you spend money. Scotiabank has a unique savings program, called Bank The Rest, that rounds up your purchase to your choice of either the nearest $1 or $5. The extra amount is automatically transferred to a savings account for you. You can open an account in whatever way works best for you. Make sure you get all of your ducks in a row, and then you can start saving. This is a kind of fun way to save. You will bank more if you choose the $5 option, since your purchases will be rounded up to the nearest multiple of five. Consider: If you make a purchase of $6.45, you’ll only bank $0.55 if you round up to the nearest dollar. Round up to the nearest multiple of five (to $10 in this case), and you’ll bank $3.55. That’s a better automatic savings. Is Bank the Rest the Best Way to Save? Even though this sounds like a cool program, it’s important to consider some of the realities of the situation. First of all, while this might sound like an easy way to save, the total savings may not be that much. If you use your debit card 30 times a month, on average your savings would be either $15 or $75, depending on the option you choose. This would be $180 or $900 a year. As you can see, the $1 option does not build up a very large balance in your savings account. 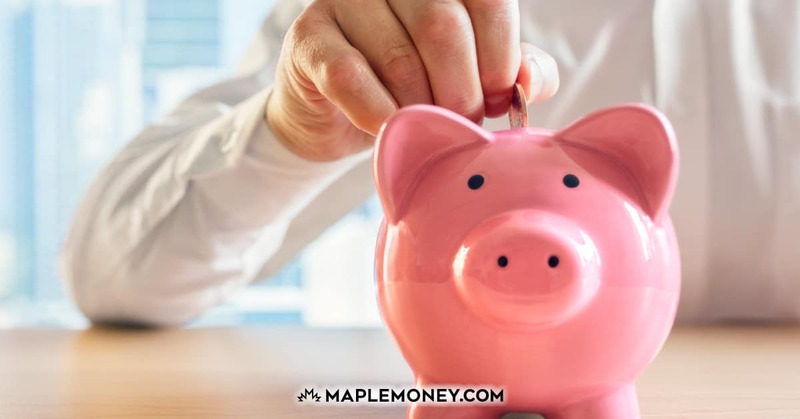 The $5 option could lead you to a significant balance in your savings account, but it might have been at the expense of your chequing account. That brings me to another issue. If you track your spending, you need to make sure that you account for the money that is being moved from your chequing account to your savings account. If you don’t remember that a $7.50 purchase is, in actuality, a $10 purchase, you could overdraft. In fact, overdrafts could become serious problems if you aren’t careful to think in terms of rounding your total up to the nearest $1 or $5. As you can see, this program combines spending and saving. The reality, though, is that you aren’t really saving money unless you are truly setting that money aside without spending as much or more to make it happen. If you are looking for a way to save money automatically, consider setting up an automatic withdrawal from your chequing account to your savings account. This way, you don’t have to spend extra money in order to put a little cash in your savings account. An automatic withdrawal to a savings account allows you to “set it and forget it” without the need to get caught up in spending more money. It’s just as easy, requires as little thought, and it won’t reinforce the idea that spending is a good idea. If you’re a Scotiabank customer, their TFSA would be a good choice. You could have it set up to automatically save $75 a month and still have $900 in a year, but you wouldn’t have made unnecessary purchases to get there. It’s not that this is a terrible idea. But you can accomplish the same thing while cutting your spending. Don’t get me wrong though, it’s good to get ahead from your own spending, but put someone else’s money aside instead. Instead of this savings program, get a good cash back credit card. My favourite lately is Scotiabank’s Momentum VISA Infinite card, where you can get up to 4% from your purchases, so go ahead and save that instead! I always taught my kids there is a big difference between spending and savings. Mixing spending and saving is a recipe for disaster. The two should be kept separate! I would never spend my money and think I was savings! Banks do a disservice to there customers when they suggest these hair brain services! I love that you wrote about this Tom. I have a friend who works for Scotiabank and although the program is a great way to set up automatic savigs he says there was some confusion by clients when the program first launched. It wasn’t clear that the rounded up money was taken from the clients own savings account. Clients thought Scotiabank was saving on their behalf (I know it’s crazy) and it actualy eneded up with some chequing accounts being overdrawn. As a consumer I love forced savings and this is a great way to do it. I am not a Scotia client but my friend set it up and he uses the money at the end of the year to go on vacation. Wait till the “Acorns” app comes to Canada. Acorns does the dollar round-up thing on ANY linked debit or credit cards from any bank and automatically invests it in one of five available ETF portfolios (Vanguard ETFs are heavily represented). Google it. Very cool app!